Every year for the past twenty-seven years around Valentine's Day there has been an interesting gathering of folks at Luckenbach, Texas, to celebrate The Hug-In. 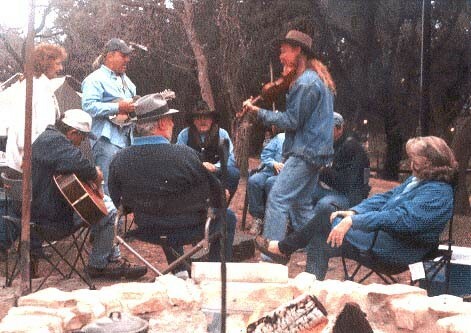 The "Old Three Dozen" chili heads began to gather at Uncle Troy King's campsite. Uncle Troy was an old outdoorsman and storyteller from far West Texas who became a fixture at Luckenbach. Troy always had a big pot of beans going for anyone who needed a meal, and he cooked up his famous fried biscuits and other things in and around his campfire all weekend. Uncle Troy went on to better things a couple of years ago. Up until this year, his memorial campsite just wasn't the same. The number of folk visiting it dwindled. Friday afternoon found George hard at work preparing for the evening meal, which was to be Pork Picado and his famous Jalapeno Cornbread. First order of business was to get a good hardwood fire going to provide coals for George's Dutch ovens. Oak is George's wood of choice, with mesquite running a close second. George is no novice at campfire cooking. He's learned a lot over the years. All the peeling, dicing, slicing, washing and sorting is done at home ahead of time. All the ingredients are stored in zip-lock bags. Of course, George lets Marta help with getting things ready. First order of business for making Pork Picado is to sear the meat in vegetable oil. George puts a shovel full of coals on a level spot and sets the Dutch oven over them. When the temperature is right, the pork goes in the pot. Such a large amount as was used here requires that the meat be seared in several portions. When done to George's liking, the seared meat was transferred to another Dutch oven that was kept warm with a small amount of coals. George seasoned the meat with salt and black pepper as he seared it. All the meat having been seared, it was returned to the original Dutch oven, the vegetables and other seasonings added, the lid placed on and coals heaped on the lid to get heat from bottom and top. After a couple of hours, with occasional checks for progress, the Pork Picado was done to perfection. When the dinner gong was rung, the camp fell nearly silent. All you could hear was lips smacking and "Ymmmmmm". Everyone filled up on George's cooking plus side dishes brought by the faithful. No one left hungry. If they did, it was their own fault. Brown the meat in the oil in a heavy skillet or Dutch oven. Season to taste with salt and black pepper. Don't overcrowd the pan; do it in several batches. Remove the browned meat to a Dutch oven and keep it warm while completing the browning. Add the bell pepper, onion and garlic to the meat and return to the heat and stir until the onion and pepper are limp. Add the tomatoes and spices. Cover and (if you are not cooking with coals) put in 350-degree oven. Check after about thirty minutes. Stir and add a little water if needed. Continue cooking until meat is very tender. This recipe is based on the classic Bistec Picado recipe which uses beef strips instead of pork. If the beef is cubed, it becomes Guisado. It can be cooked quickly like a stir-fry and served over rice or in warm tortillas. If it is topped with Monterey Jack cheese, it is Guisado Monterey. Made with chicken and topped with cheese, it is Guisado Monterey with Chicken. How's that for an all-purpose recipe? George's chuckbox. This keeps all his camp cooking gear together. Note flashlight and box of kitchen matches. In a heavy skillet or Dutch oven, saut the chicken and sausage in a small amount of vegetable oil. Add the onion, celery, peppers and garlic. Continue sauting until the vegetables are limp. Add the remaining ingredients except the green onion, cover and simmer 45 minutes to an hour or until the rice is tender. Stir in the green onions and simmer a few minutes more. Adjust seasonings and enjoy. These two recipes double well if you are serving a large group. George quadrupled the recipes at Luckenbach.